This year’s Day of Science (Tag des Wissens) takes place at Hamburg University of Technology and the topic ‘Technology and the Digital World’ couldn’t fit better to our project! We can’t wait to welcome you to experience RUVIVAL along with around 50 other interesting projects presented by different universities and research-based companies. Together with two other Hamburg Open Online University projects, Kniffelix and MikiE, we would like to introduce you to the world of online learning! We prepared a little game: The Wheel of Fortune will decide which questions have to be answered. Find the right answers by using our online content. For the ones who can find the most solutions, great prices are waiting! Furthermore, Ruth Schaldach, member of the RUVIVAL team, is going to take part in an event held by the ‘Centre of Teaching and Learning at the TUHH (ZLL)’ She is going to demonstrate the possibilities and advantages of innovative methods in online education on the example of our RUVIVAL Simulation Game . To get to this event,you don’t even need to leave the building! It’s just around the corner in room H0.04 and will start at 14:00. If there are already questions popping up into your mind, you can note them here and if they are matching the overall content, they will be included in the speech. 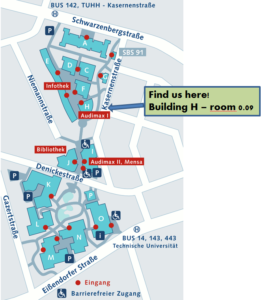 How to reach us: Take the S3 or S31 to the station Harburg Rathaus and then follow the signs! Or you catch the bus no. 14, 143, 146, 443 or 543, and get out at Eißendorferstr. (TU Hamburg). See you soon at the day of Science in Hamburg!